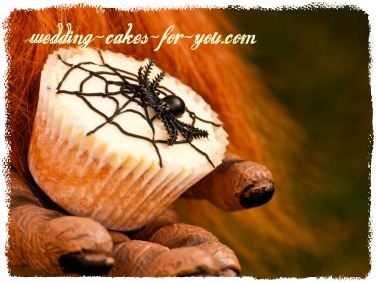 Wickedly delicious Halloween cupcakes are at your fingertips. Try the scandalous Black Bottom cupcake recipe or venture into the unknown and experiment with unusual ideas of your own making Bwahhhhh!!!! The video really captures the horror and bloodiness of the cake and the costumes. Enjoy!!! Maybe you would prefer something a little less gruesome? How about these really cute chilly ghost cupcakes in the video, they are super easy. The video shows the chilly ghost cupcakes made using ice cream centers with Cool Whip on top. Obviously these would need to be eaten pretty quickly, which is not a problem...You could substitute the filling for chocolate ganache or other delicacy and the ghost with buttercream, a firm white chocolate mousse or stabilized whipped cream. if you prefer to display them for any length of time. You can use all types of icing for topping cupcakes. Italian Meringue buttercream can be flavored in many ways. Use your imagination and experiment with Halloween cupcakes using your favorite flavors. I have some ideas for you on the icing pages. 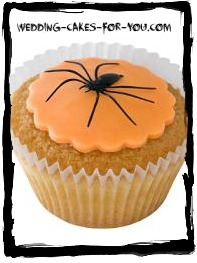 This cute little scary spider topper is made using either a royal icing run out or even easier fondant. Fondant can be colored, rolled out and cut into shapes using cookie cutters or special fondant cutters. The spider can be made using sugar paste, royal icing or if you really want to keep it simple use a store bought plastic one from your local craft store. This is a really yummy fall inspired recipe and is perfect for Halloween cupcakes or a Thanksgiving dessert. Peel and chop 4 Granny Smith Apples or apple of your choice. Stir together 1/2 cup of melted butter, 1 cup of sugar, 1 cup of firmly packed brown sugar, 2 large eggs and 1 teaspoon of vanilla extract. In another bowl combine 2 cups of all purpose soft wheat flour, 1 teaspoon of baking soda, 1 teaspoon of salt and 2 teaspoons of cinnamon. Add the dry to the wet ingredients and stir well. Place paper baking cups in 2 12 cup muffin tins. Spoon the batter into the cups filling them 2/3 rds full. The batter is quite thick. Bake for 12-15 minutes or until a wooden pick inserted in the center comes out clean. Cool in the pans or on wire racks for 10 minutes. Remove and cool completely. 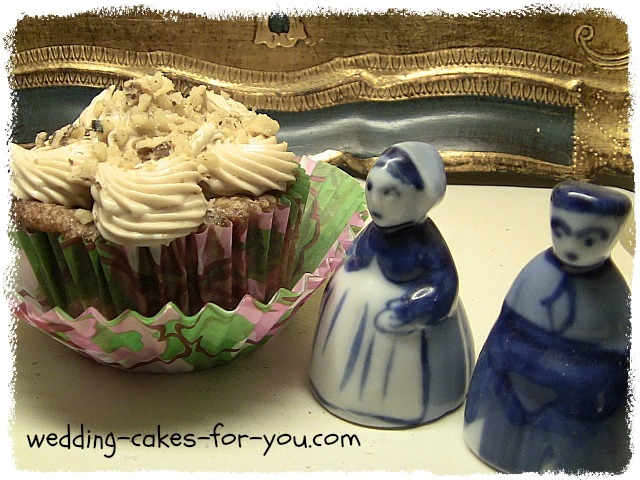 If you love a browned buttery flavor this frosting is for you goes perfectly with the fresh apple cupcakes but also complements a good dark chocolate cake. Try topping each frosted Halloween cupcake with toasted pecans and a tiny crab apple for a sweet decorative touch. Melt 1 cup butter (two sticks) in a 3 quart heavy saucepan over medium heat. Add 16 ounces of dark brown sugar; bring to a boil, stirring it constantly. Stir in 1/2 cup evaporated milk, 1/4 teaspoon baking soda, and 1 Tablespoon corn syrup; bring to a boil. Gradually add 4 cups of powdered sugar to the caramel mixture, beating at medium speed with an electric mixer until it is all blended. Beat at high speed with an electric mixer until the frosting is creamy. Use right away. TIP: The icing takes a while to cool to just the right piping consistency. I also added about 1/2 cup more softened butter to the mix as I was beating it. Put the bowl in the refrigerator to cool it for about 20 minutes and then mix or whip until it thickens. 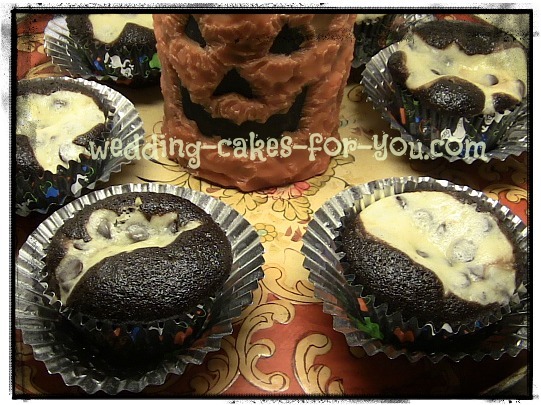 These are devilish Halloween cupcakes!!! This recipe takes me way back as I used to make them often. They are so scrumptious, you will hate me for it. LOL. In a small bowl; combine two-3 ounce packages of cream cheese, softened, 1/3 cup of sugar and 1 egg; mix well. Stir in 1 cup of semi sweet chocolate chips; set aside. In a large bowl, combine 1 1/2 cups of flour, 1 cup of sugar, 1/4 cup unsweetened cocoa, 1 teaspoon of baking soda and 1/2 teaspoon of salt. Add 1 cup of water, 1/3 cup of oil, 1 Tablespoon of vinegar and 1 teaspoon of vanilla; beat for 2 minutes at medium speed. Fill paper lined cupcake tins; top each with 1 teaspoon of the cream cheese mixture. Bake for 20 to 30 minutes or until the cream cheese mixture is light golden brown. Cool for 15 minutes, remove from pans and cool completely. Store these in the refrigerator. These are ridiculously decadent. I dare you to eat a whole one. 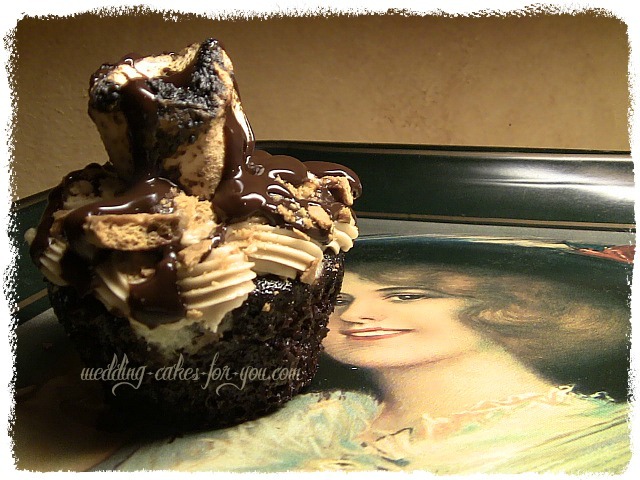 The Smore's cupcakes are made using the black bottom recipe with caramel icing, but you can use vanilla or any other flavor. Graham cracker's are crushed onto the frosting, then a drizzle of chocolate ganache: 1 cup of heavy cream warmed up, add 8 ounces of high quality semi sweet or bittersweet chocolate, stir until melted. For the final topping add a roasted marshmallow. Roast them over your stove or grill just as you would over a campfire. ENJOY!!! 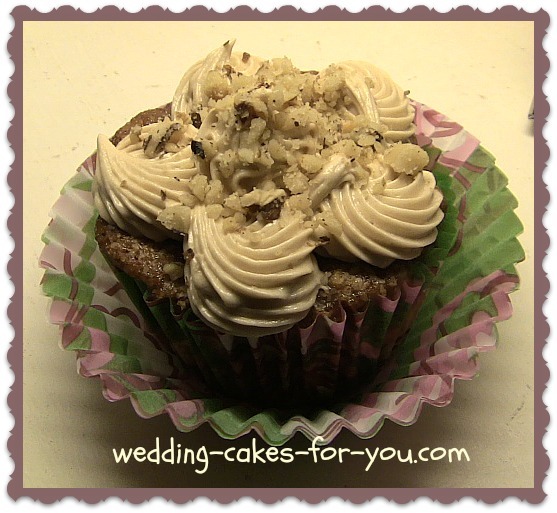 For the BEST carrot cake recipes that you can imagine click on the photo of the slice of cake. You will find my best choices for moist and spicy awesomeness. Thank you for visiting Wedding Cakes For You. I do hope you enjoy the information here and find it useful. 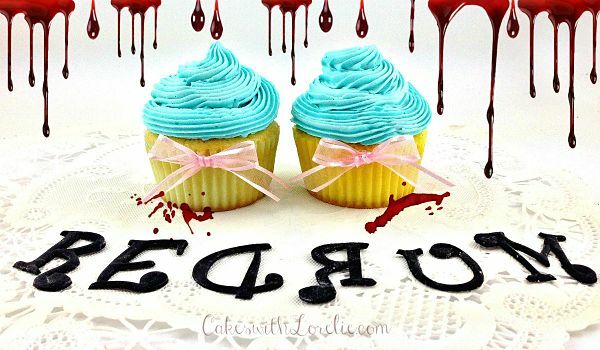 Browse these other Halloween and cupcake decorating ideas pages.